WASHINGTON, DC, June 8, 2012 (ENS) – The 2013 Honda Fit EV has received the best fuel efficiency rating ever issued by the U.S. Environmental Protection Agency – 118 miles per gallon equivalent, MPGe. MPGe is an efficiency measure based on how far a car can travel on the amount of electricity with energy equivalent to that in one gallon of gasoline. The 2013 Honda Fit rating is higher than the 2012 Mitsubishi i minicar, the previous record-holder at 112 MPGe. It is much higher than the Nissan Leaf at 99 MPGe, the Ford Focus Electric at 105 MPGe, or the Coda at 73 MPGe. With an EPA rated annual fuel cost of only US$500, the 2013 Honda Fit EV can help consumers get more miles for each charging dollar, Honda said in a statement Wednesday. The Fit EV’s 20 kWh lithium-ion battery provides the capacity to earn an EPA combined city/highway estimated driving range rating of 82 miles. This distance is greater than that of the Focus Electric at 76 miles, the Leaf at 73 miles, or the Mitsubishi i at 62 miles. “Just as important as the industry-leading fuel-efficiency and fast recharging time, as a Honda, the 2013 Fit EV will be an absolute kick to drive,” said Steve Center, vice president of the American Honda Environmental Business Development Office. Center says the Fit EV’s “exceptionally efficient design,” with savvy powertrain design, weight-conscious engineering and effective aerodynamics, makes the most of the Fit EV’s smaller battery. The Fit EV’s battery can be recharged in less than three hours from a low charge indicator illumination point when connected to a 240-volt circuit. 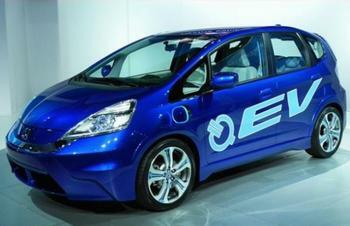 The Fit EV produces zero emissions and no petrol is used to propel the car. Honda says that in addition, the source of electricity for many charging locations includes energy from renewables like hydropower or wind. More and more homeowners are installing solar panels that could provide a clean energy source of power for the Fit EV. Honda debuted the 2013 Fit EV at the 2011 Los Angeles Auto Show and announced plans to begin leasing the battery-electric commuter vehicle to customers in select California and Oregon markets this summer, followed by an East Coast rollout in 2013.